A year ago, the Fortune investment team picked an “All-Tech Portfolio.” Our thesis was that the companies that proved best at leveraging technology—no matter their industry—would deliver the best results for ¬investors. How did that thesis play out in the markets? So far, so good: During an unusually volatile 12 months, our global portfolio (eight of 31 stocks were non-U.S.) returned 5.2%. That handily beat the MSCI World stock index, and fell just shy of the S&P 500’s 6.6% return. 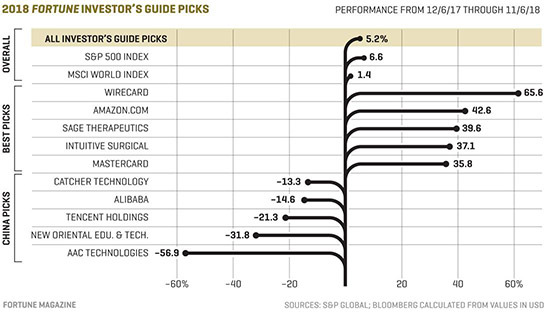 And if you exclude our five Chinese stocks—which, of course, we won’t—we delivered a hefty 11.5% return. Here’s a roundup of what did and didn’t work. Fintech on the Rise: Our best-performing picks were financial stocks, where credit card giant Mastercard and German payment processor Wirecard had monster years. Both are leaders in building e-commerce tools and upgrading digital financial infrastructures, and investors took notice. Healthy Returns: Anticipation of FDA approval of its postpartum depression drug lifted the shares of Sage Therapeutics. Meanwhile, Intuitive Surgical continued to ride robots to big market gains. Its da Vinci Surgical System can help reduce postoperative recovery times and slash costs, making it catnip for hospital customers. Turmoil in Tech: We didn’t foresee the data-privacy face-plant at Facebook, whose shares are down 15% since we picked them (but which we now see as a buy again). Fears about how a U.S.-China trade war might disrupt the tech supply chain hurt chipmakers in general, including two that we recommended, Applied Materials and Germany’s Infineon. Speaking of China: Those trade fears, along with a slowdown in GDP growth, dragged down most Chinese stocks this year (see the chart in this story), and each of our five China picks lost at least 13%. The hardest-hit: AAC Technologies, which makes “haptics” that create clicking and vibrating sensations in mobile phones.